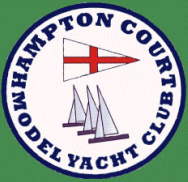 The Model Yachting Association race programme for 2018 got off to a flying start at Hampton Court MYC on the 7th January 2018 with their annual Charity event. As in previous years the event was sailed in aid of a local charity, "Momentum", set up to help children with cancer and their families. Due to a particularly bad winter for colds and flu, five skippers had to withdraw leaving 20 One Metre sailors ready to enjoy some keen competition. Following the Race Officer briefing and the customary photo call the first seeding race was started at 10.15. Hugh Mcadoo and Tony Guerrier took first place in their respective heats. The sailing conditions couldn’t have been better, the wind was blowing 15 – 20 mph straight down the lake from the North East which gave the skippers long windward/leeward legs whilst their boats were always within easy viewing distance. Racing continued throughout the day at a good pace and without drama despite the squalls that seemed to blow down to the bottom of the lake thirty seconds before most starts. In third place, and keeping it in the Guerrier family, was Austin Guerrier on 28 points which was also the same points for Ian Davies but on countback Austin had a first place in race 7 to count. Prizes were awarded for the first 5 places and the Race Officer thanked everyone for coming and making an excellent contribution to this worthwhile cause.